Welcome to Episode #30 of the Living Homegrown Podcast! Homemade cranberry sauce is not just for Thanksgiving. It is also the most amazing sandwich spread on those AFTER-Thanksgiving turkey sandwiches! What I love about this recipe is that it is simple, adaptable (while staying safe) AND it has the most amazing flavor. If you are going to be a guest at someone’s Thanksgiving meal, whip up a batch and bring a jar as a hostess gift. Tell them this is special for them to enjoy the day after the big meal. They will so appreciate it. Plus…You can process it or NOT. Removing Foam from Your Jam : The video below demonstrates the same method mentioned in the podcast – using wax paper to remove jam foam. Check it out at 1:18 into the video. 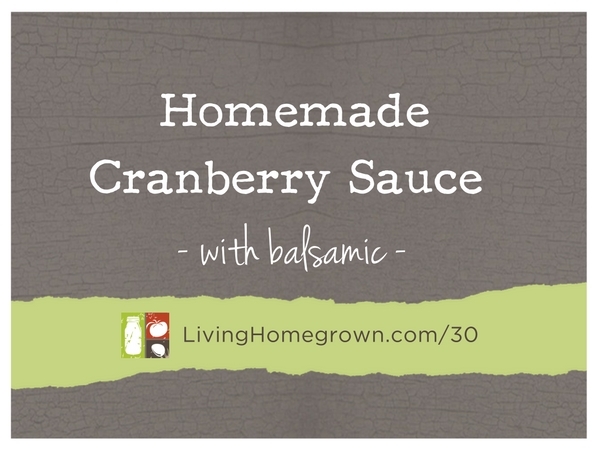 Have you made fresh cranberry sauce before? Will buy cranberries and make this as soon as I go to town! Sounds devine! Canned cranberry sauce is getting too expensive, too. I cant wait to have this! I love your information and canning ideas!! New favorite website. New favorite podcast! Thank you! I made this recipe. It is wonderful, But I was low on white sugar so I substituted some of the the white sugar for coconut sugar I got from Costco. The coconut sugar gave it a great “deeper” rich taste to it. I’m excited to give my jars as gifts, and eat the foam on our pancakes tomorrow morning. Yummmmm. I’m glad you are enjoying the podcast and website! I have never used coconut sugar. I had to look it up to verify that it would not alter the pH. It seems to be neutral so I think it is okay to use. Does coconut sugar cook up with the same consistency as regular sugar? I’m just curious how it holds up in a typical recipe (i.e. cookies, etc). From what I have read, it has the same number of calories as cane sugar and can be substituted in most recipes. This is actually the first time I used it in anything except coffee, and I’m happy with how it turned out. Oh Amanda – Thanks so much for letting me know. Glad you liked it!